Submitted by dunahan on 2019-01-13 04:39. Due the version there isn't working for me, I'm creating a new app for windows. 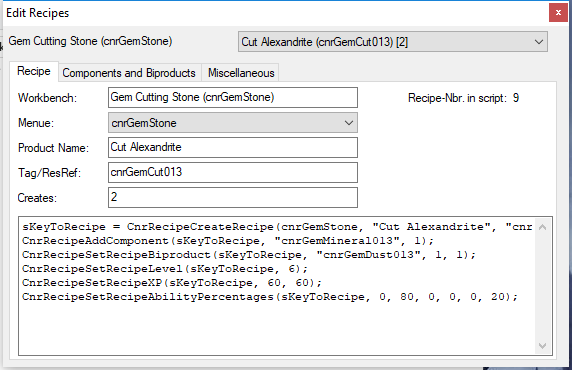 For now, it only views the recipe within the script, allows editing of the components/biproducts and actualizing the script snipped at the recipe tab. 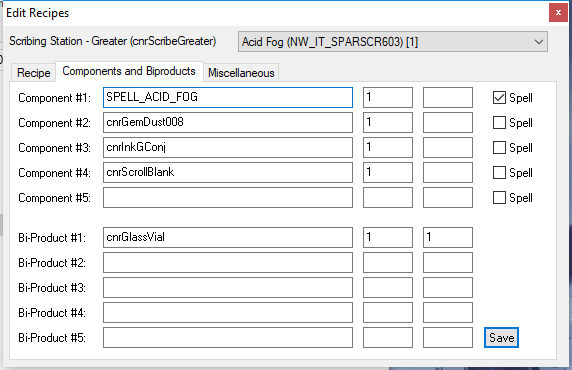 Later it should be possible to fully copy/change or create a new recipe and there for, the desired nss-file . Within the 7zip-file you should find a compiled 32-bit and a 64-bit executeable. Three csv-files with names/tags/resrefs for items and placeables. For the spells, I copied the constants from the lexicon. A config-file, (yet) needed folders and the original-scripts from the CNR v3.05. I've added the sources to the 7z, that are provided on GitHub (https://github.com/dunahan/ahk_cnr_ve) too. To get it working, it needs the config, the csv's and the added folder-structure. A screenshot is provided here too. If the config isn't available, the assistant will create one, along a language file. The CSV's (all available through github) are needed, along with the scripts from CNR (downloadable through vault, look at connected projects). - Some bugfixes and also actualized the code to be compatible with newer versions of AHK. - Created a numbering system to make changes to scripts easier to complete. Althought it isn't possible yet to change the script directly. 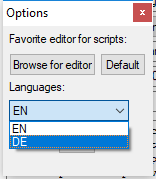 - Added the possibilty to change the preferred text editor and language in the options window. - With neverwinter.nim by niv the assistant can now extract all files from an erf and they will showed. - Some bugfixes and also new functions (yet deactivated) for direct download of necessary tools. - Now it should be possible to fully edit (components, biproducts and all the other miscs) a recipe within the assistant and save the modified version to the script snippet on the recipe tab. 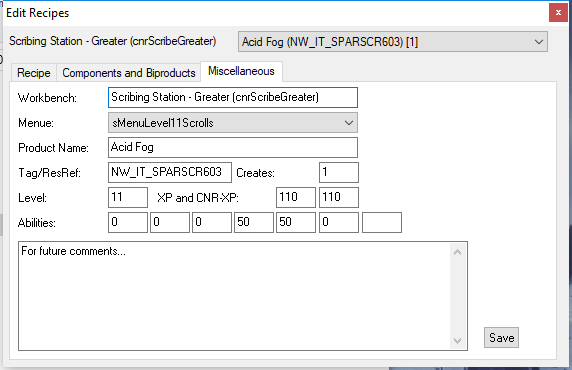 - All of the scripts can be viewed (didn't test it with all, so please report it if its not readable), changes can not be saved yet, but are viewable (and can be copied) in the script snippet of the recipe tab. - New compiled 64-bit executable along with the 32-bit version. Removed the sources, they are accessible through github. - Config file will be created and along with a language file, which you can change for different languages. - Most of the scripts are viewed, but changes can not saved yet. This will follow in the next few updates. - Added a 64-bit executable along to the 32-bit version. - Zip contains sources (as on github), unchanged cnr*.nss', item/placeable/spell-csv-files. Updated to version 0.802. Now most of the recipes should be viewed, but changes can not be saved yet. Updated to version 0.8.0.4, yet the save-button is in a early state. As it shows more debug messages. The save button now actualizes the script snippet on the recipe tab. So now it is possible to change the components and biproducts. Copy that snippet and replace it within the nss-file. But all recipes should be accessible through this version. I plan to support fully editing of everything of a recipe, also to create/change the nss-file itself. 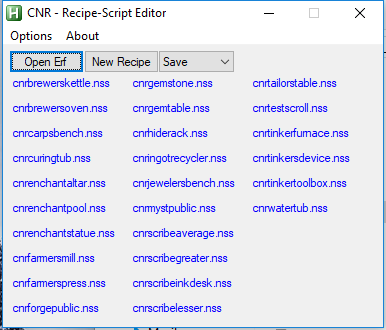 Now it is possible to fully edit a recipe, save it to the script snippet on the recipe tab and copy/paste it to the nss-file. It is also possible to open the nss-file directly out of the assistant (at first with notepad). Working at opening/creating erf-files from the assistant, so it should be possible to open the exported nss from the toolset and work with that. Then to create the erf-file so you could import that again.